We celebrated New Years at the Singapore airport while standing in line at gate security. It’s better than it seems: the best part about traveling on New Year’s Eve is that entire planes fly unfilled, so we all had enough room to stretch out and get a good night’s sleep on the 8 hour flight to Sydney. Staffan and I also took the time to reflect on 2013, extremely happy that so many of our wishes and resolutions had been fulfilled. New Year’s Day in Sydney felt absurdly “back to normal”. No one really cared to check us in or help us with our luggage at the hotel. The reception workers were watching the clock, waiting for their shift to end, unapologetic. We’d have to come back after 3PM when the rooms might be ready. There were no more roll-aways for the kids, and No, we could not possibly place a mattress on the floor. Welcome back to the western world! To fit in, we decided to brush our teeth with the water running and demand new towels and linens each day. Just kidding, although the access to water with which we could brush and rinse our toothbrushes felt like a luxury after almost 5 months requiring bottled water, and I have to admit that for the first few days we treated ourselves to it with reckless abandon. 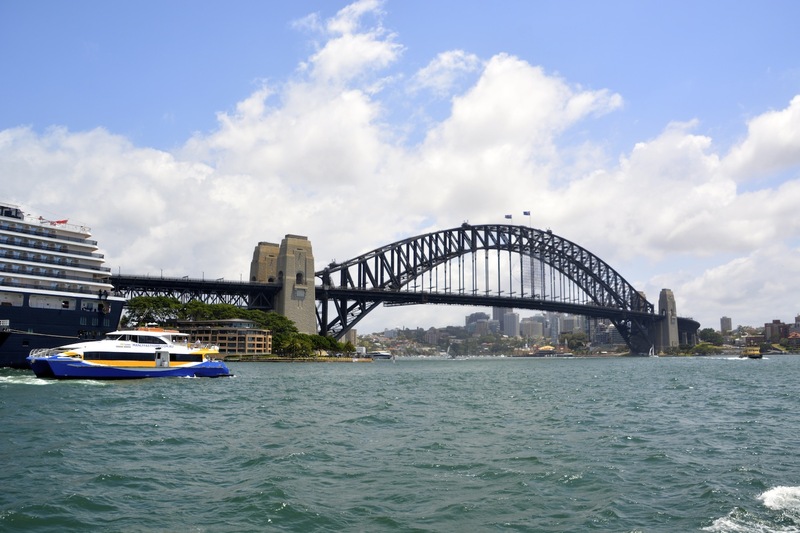 The pros and cons of traveling in the developing world versus the developed world were recurring topics in our conversation that first week in Sydney. A little jet-lagged, we walked around the city teary-eyed and disoriented. Sydney proper was a ghost town, its residents and tourists having celebrated New Years Eve the night before to what we were told is the world’s best fireworks display. Staffan and I tried to place the feel of it: the streets were as empty as downtown Los Angeles, the people as polite as Portland, with neighborhoods as diverse and distinct as San Francisco. Alas, it was hot as hades. While the US was experiencing record polar vortex chills, Australia was experiencing record heat waves. 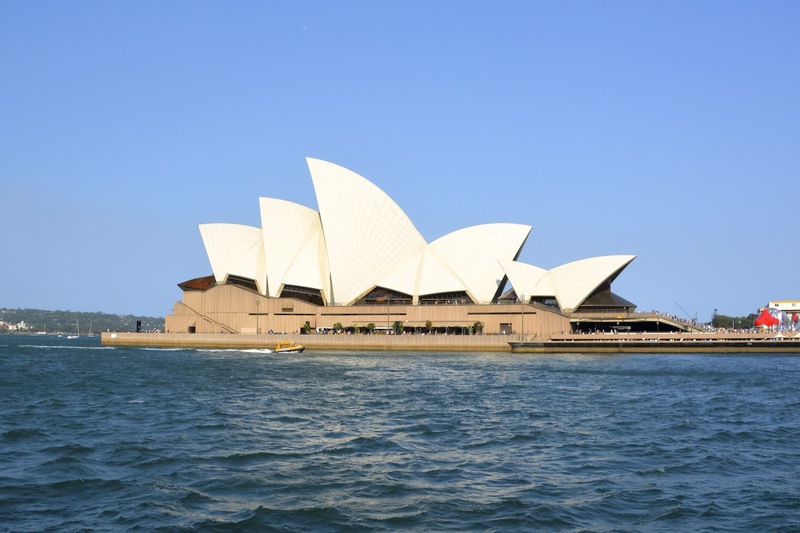 The city came into its own spectacularly when we reached the botanical gardens and made our way down to the waterfront to see the Opera House. What a structure. The vision of it immediately shook me out of the familiar and reminded me that I was in a place (and a continent) I have never before been. My curiosity returned and the city became a place of great excitement to poke around and explore. We were particularly interested to visit Bondi Beach, a surfing mecca within the city limits. We took a 40 minute bus ride through town to arrive at the picture-perfect, white-sand beach in a semi-circular cove. It was absolutely packed with people, with only small walkways between the colorful beach towels. The atmosphere was light and friendly: summertime. Though the sunbathers rival 90210 in physique and attire, the lifeguards were decidedly un-baywatch. They were more like stout beach policemen. Donning red surf shorts and yellow rashguards, they were very serious about their task at hand of herding and confining thousands of happy swimmers. Surfers definitely have the right of way in Australia: less than 10% of the water is allotted for swimming. In fact, it is the exact opposite of Zuma beach in Malibu where the surfable sections get whittled down as the day progresses until one can only surf north of lifeguard stand 13. The Bondi lifeguard force relentlessly patrols the shore, directing the swimmers to squeeze into the middle of the cove until they form a dense line protruding into the Pacific. Honestly, the hoards of swimmers looked like a cult hell-bent on parting the sea. We had fun nonetheless, sneaking into the water at the edges of the cove, feigning ignorance of the foreign swim rules, and playing with our sand toys. The start of the Bondi to Coogee cliff walk. The strollers were wonderful to lug up the many stairs. 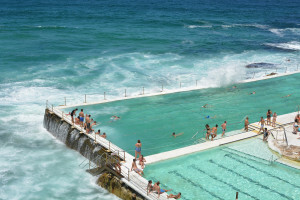 At the southern end of Bondi beach is Icebergs, a famous ocean swimming pool/club that gets pounded by the surf. Its aquamarine lanes match the ocean waters, and remind one of Australia’s great olympic swimmers. Walking south from Icebergs, one can continue for six kilometers along the sandstone cliffs on the Bondi to Coogee clifftop trail. It was an absolutely beautiful walk, full of wind-eroded rocky overhangs, curving paths to stunning coastal vistas, and many sightings of large, stationary hawks and smaller colorful birds. We stopped along the way at a couple of coves where the kids could run around, check out the playgrounds, and we could watch the surf. There are even a couple of snorkeling spots along the way. The bus back to the city was packed with beach-goers, the excellent public transportation being a clear sign that we were far from LA. 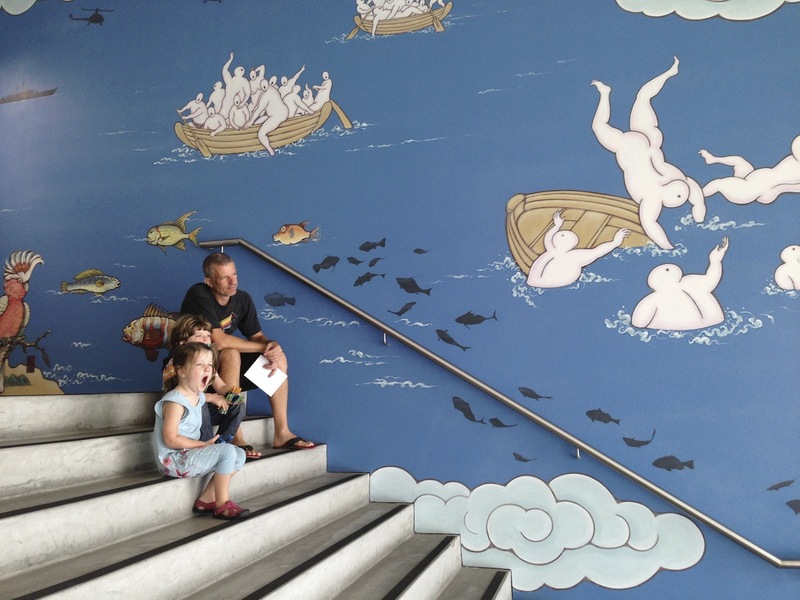 Given that the kids have seen more than their fair share of temples, palaces, and historic sites, we were determined to find some good playgrounds and visit the aquarium. 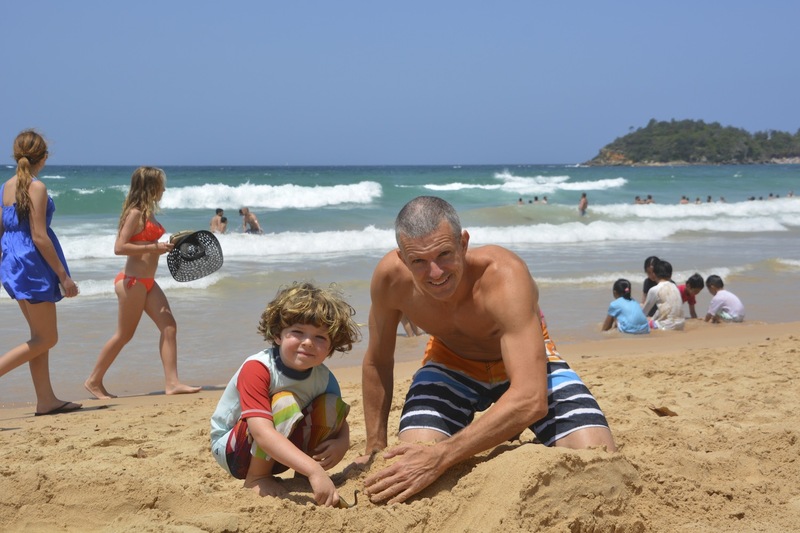 Phineas and Eilir were thrilled: Sydney boasts many family parks, with newly designed, state of the art playgrounds and water feature parks that can rival almost any we’ve seen in the US or abroad. (The Jardin du Luxembourg in Paris still trumps all in character and atmosphere.) We were happy to visit the modern if anonymous playgrounds on multiple occasions, as we found the other area attractions to be extremely expensive and a bit over-rated. I won’t dwell on it, but we suffered serious sticker shock at the cost of traveling in Australia. From the aquarium to transportation to food, everything is at least double what it would cost in the US. We quickly familiarized ourselves with the best groceries and we’ve been happily picnic-ing ever since! As always in city visits, we beelined to the contemporary art museums and sought out local specialties in the fringe neighborhoods. Though we were not overly fond of the Yoko Ono exhibit at the Museum of Contemporary Art, we did enjoy the museum’s rooftop cafe and their permanent collection. We explored three interesting neighborhoods: arty and gritty Surry Hills, laid back and international Glebe, and the slightly more upscale designer Paddington. One remarkable architectural feature of Sydney were the Victorian terraces. These two-story rowhouses are made of painted brownstone or brick, with ornate wrought iron balconies that reminded us of New Orleans. They were present in all the most interesting areas of the city. One could see a clear trend of uncovering and renovation, similar to the Queen Annes and Victorian houses in San Francisco whose details were once covered up by stucco in a minimalist trend after the world wars. Wherever we found the terraces, we also were sure to find great Indian food, perhaps a sign of a young-family demographic with similar budgets and palates as our own. 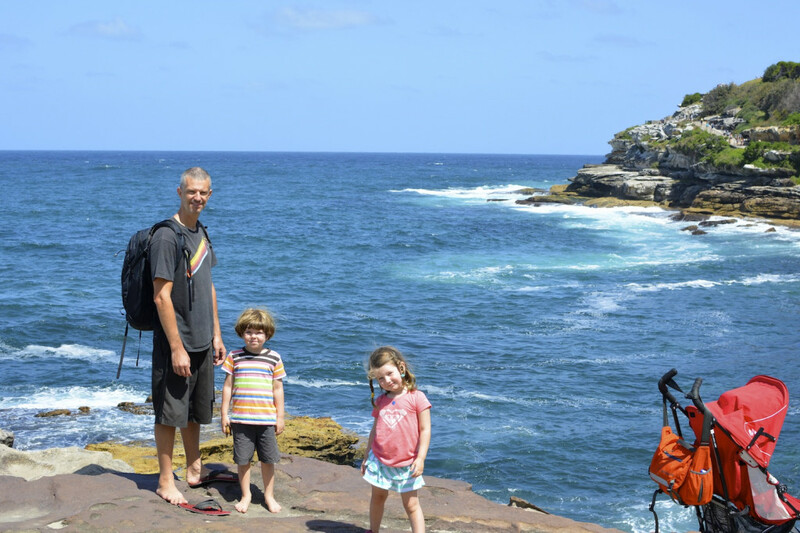 Looking to round out our tour of Sydney, we took the ferry over to Manly, a northern peninsular suburb that has both ocean and bay facing beaches set only a few blocks apart. Once again, we joined throngs of city-dwellers to board the public ferry for a 25 minute, picturesque ride out of town. Everyone was toting beach bags, umbrellas, or surfboards. We went oceanside (of course) and had a beautiful day playing with the kids in the waves and on the beach. 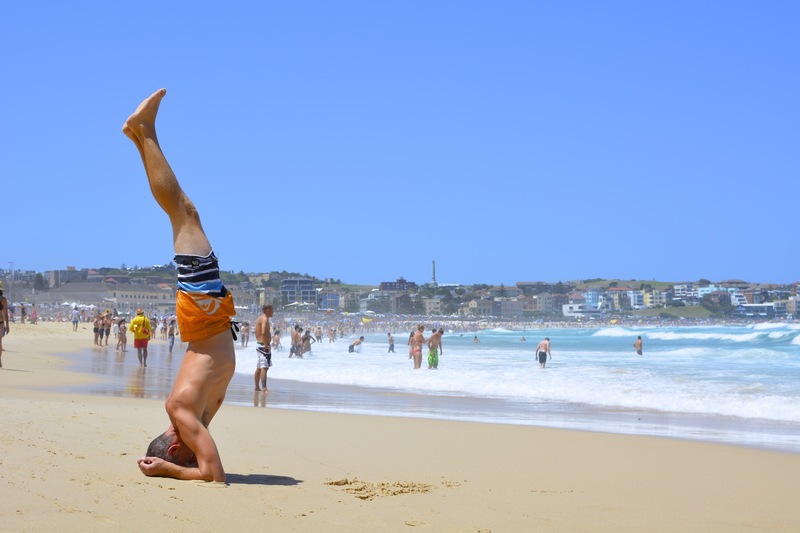 Somehow, with Bondi, Manly, and the other beaches all accessible by public transport, they become more a part of the city’s identity and culture and add an element of lighthearted fun to the otherwise business-oriented Sydney. Eilir still cannot figure out how to eat without getting her food on her forehead- every meal. Sitting at the entrance steps of the Museum of Contemporary Art. Eilir’s already yawning. A rest stop on the trail. Eilir posing on the cliffs. She does not get this from her Mom. Eilir dancing at the end of the cliff walk. We don’t know whose daughter she is. Saw sword fish: the best part of the aquarium. Yay! water relief! I wish this were a private park so I could go in too! Eilir picked out a pink and gold 2 piece bathing suit, further differentiating herself from her mother. We made the sydney opera house! !